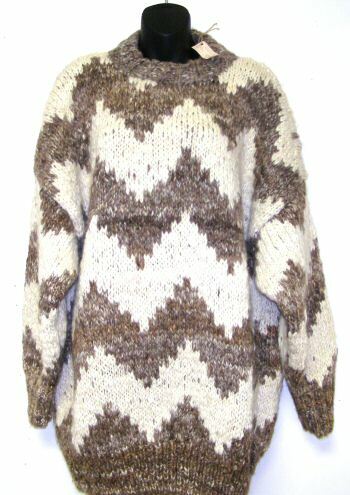 Sweaters from Africa! Surprising isn’t it? But the highlands are chilly in the evening and the sheep productive so sweaters are not so uncommon as you might think. Martin, a disabled Kenyan man and his wife, knit to support their young family. This sweater is 100% wool knitted by hand. It is a loose enough knit to allow plenty of trapped air space to keep you extra warm. It is large enough for most to allow a few additional layers underneath as well. It measures 31″ from shoulder to shoulder and 29″ from shoulder to ribbing. The 20″ sleeves end in 4″ of ribbing. These sweaters can be worn as his or hers. For couples that want a sweater that may be just a tad different, check out our Box Sweater. The Zig Zag and the Box Sweaters are a truly one of a kind.